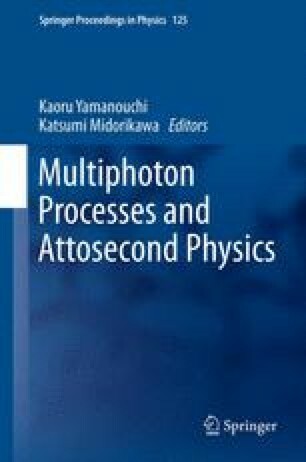 We demonstrate the interferometry and Fourier analysis of the attosecond pulse train (APT), which is formed with the Fourier synthesis of multiple high-order harmonic fields in the XUV wavelength region. The ion yield originating from nonlinear interaction of the APT with the nitrogen molecule exhibits the interference fringes of the XUV harmonic fields on the pulse envelope of the APT in the interferometric autocorrelation (IAC) measurement. We have resolved the kinetic energy spectrum in three distinct regions in accordance with the characteristic of the fringe frequency, although the detailed ionization/dissossiation process is not clear. Another example of the IAC trace obtained from the deuterium ion dose not show the pulse envelope of the APT, while we can clearly observe the interference fringes of low order harmonic field, instead. We have determined the distinct sequential processes of ionization followed by dissociation with Fourier analysis of these fringes. The available wavelength resolution of the measurement device for the IAC, which we call “attocorrelator,” has been also demonstrated with the linear interferometry.